Edgy and feminine can coexist, and Deborah Rice’s silk dip necklaces perfectly balance the two distinct traits. 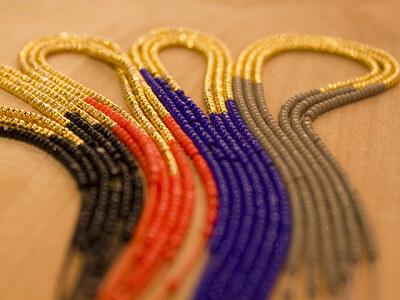 Deborah beads her own jewelry in Brooklyn, N.Y., where she hand-strings rare Charlotte-cut seed beads on slender German silk cords. The beads are made out of Czech glass, and she mixes both colored and 14k gold-plated beads to create bands of vibrant colors. The effect is simple but powerful. The beads are cut to capture and reflect the light, and they shimmer as you move. Deborah’s inspiration for her silk dip necklaces came from a silk-strung pearl necklace her father-in-law brought back from Korea after World War II. She was impressed by the unexpectedly strong silk core, and she worked the material into her own original designs. Deborah’s silk dip necklaces are feminine and elegant, yet also striking and memorable. They’re statement pieces that won’t overwhelm your wardrobe. It takes a masterful designer to juggle subtlety and boldness, but Deborah makes it look easy. Hi everyone! Indulging my love of pretty things, I use delicate objects (linen, feathers, leaves) as inspiration for my wearable pieces of art. Silk Dips, is ultra feminine with a bohemian edge. I look forward to your questions. Edgy and feminine can coexist, and Deborah Rice’s silk dip necklaces perfectly balance the two distinct traits. 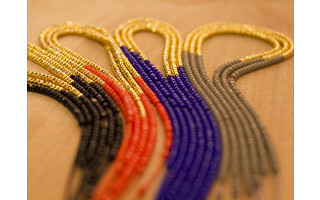 Deborah beads her own jewelry in Brooklyn, N.Y., where she hand-strings rare Charlotte-cut seed beads on slender German silk cords. 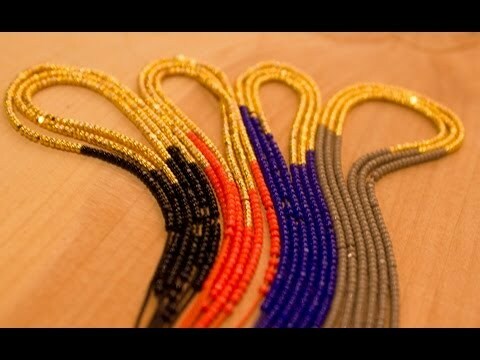 The beads are made out of Czech glass, and she mixes both colored and 14k gold-plated beads to create bands of vibrant colors. The effect is simple but powerful. The beads are cut to capture and reflect the light, and they shimmer as you move. Deborah’s inspiration for her silk dip necklaces came from a silk-strung pearl necklace her father-in-law brought back from Korea after World War II. She was impressed by the unexpectedly strong silk core, and she worked the material into her own original designs.